Summer rain… Those words are magical for me, because I live and garden in a region where it’s a rare phenomenon. (To be truthful, we on the south coast of Vancouver Island have very little to complain about, climate-wise. But we complain nevertheless). This summer has been relatively cool, but very dry. We had only one millimeter of rain in July, and the parts of our landscape without artificial watering have taken on shades ranging from brown to golden to bone-white and dead-looking. My lawns (actually remnant patches of mixed grass and subtle weeds among perennial beds and vegetable patch) retain a bit of green, but have been gradually browning over the past few weeks, like their gardener’s increasingly suntanned skin. The main gardening activity these days is watering — with sprinklers on designated “watering days” — Wednesdays and Saturdays on my side of the street — and with the trusty watering can almost every day. I have a lot of plants in pots — tomatoes, dahlias, delphiniums, Stargazer lilies (just coming into bloom) and a dozen Meconopsis (blue poppies). I grow all these things in pots because the open ground is too full of wretched tree roots — but that’s another story. The soil in their pots is all these plants have to draw on, so regular watering is vital. After several weeks, watering becomes a burdensome chore. The gardener grumbles about being a slave to the hose and the watering can. Notes of complaint appear in the daily weather record: Very dry. Still dry. Extremely dry. NO RAIN. People who exclaim about the “beautiful sunny weather” are apt to get a dissenting lecture or at least a non-committal grunt. But today it’s raining, for the first time in more than a month. The air is soft, moist and full of fragrances. A mist rises from the pavements. The rain barrels are filling up. There are three and a half millimeters in the rain gauge so far and the radar image on Environment Canada’s website indicates more to come. We might even get a whole five millimeters before it ends and a predicted warming and drying trend takes over. Five millimeters is the boundary between what I call “psychological rain” and Real Rain. Psychological rain brings a slight relief from the prevailing dryness, but is not a remedy for it. Beyond five millimeters, there is wetting of the soil below the surface. The gardener gets a reprieve from watering for a day or two, because the best thing about rain is that it waters the whole garden, all at once (except the parts overhung by wretched maples — but that’s another complaint). Not everyone is rejoicing. Golfers and planners of picnics and outdoor weddings are no doubt gnashing their teeth. But I refuse to feel guilty. I didn’t make this summer rain, but I’m glad it’s here. Rain barrels are fashionable these days. 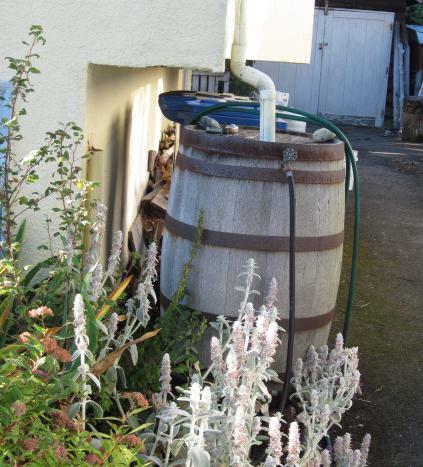 If you want credibility as an environmentally responsible gardener, you install a rain barrel or two. For about $100 you can get a purpose-made model (plastic, of course) with various nifty features. Or you can make your own. I have three home-made barrels — two used to be plastic garbage containers and the third is actually a genuine wooden barrel — very picturesque. There’s only one problem — it doesn’t rain here in the summer. In April and May my barrels actually fill up with rainwater, and I use it for the small amount of watering I do at the time — newly planted things or pots. In June, rain becomes scarce and by July nonexistent. 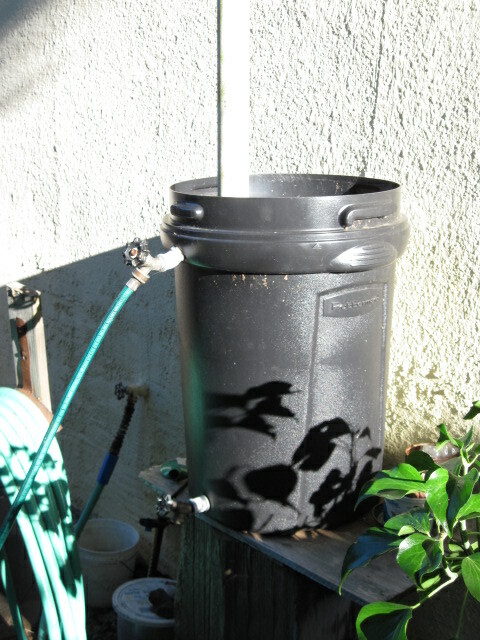 My rain barrels would be empty until late August or September if I didn’t fill them with the hose. How ironic is that? Filling up with the hose does make sense. I do that only to the two plastic former garbage cans, which are open at the top. The funky wooden barrel stays mostly full of rainwater, because I draw from it very sparingly. Empty, it would dry out and crack. But the two plastic barrels are handy water reservoirs for filling my watering can, which gets daily use through the summer. It’s much faster to fill by dipping into the barrel than starting up the hose every time. I get through an entire hand-watering session (a zillion pots plus half a dozen especially water-needy plants in the ground) on one barrel fill-up. In summer I think I should have been born under the sign of Aquarius.